Even though financial planners advise against overpaying the government throughout the year, nearly 8 out of 10 taxpayers end up receiving refunds. 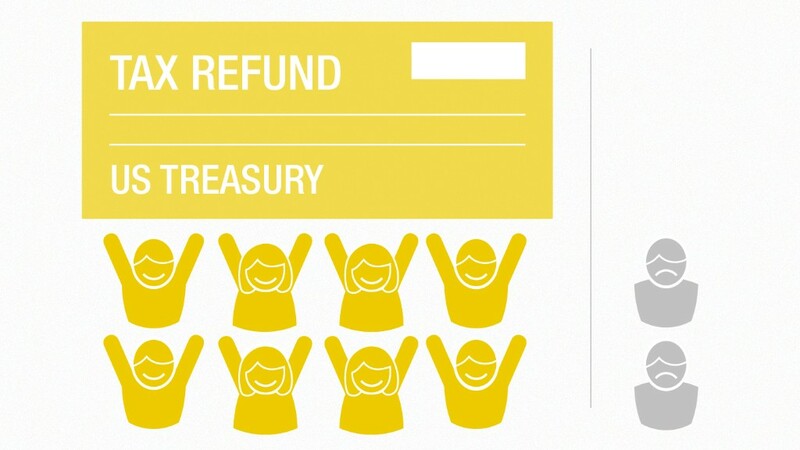 As much as people may hate paying taxes, they do love their refunds. Every year, nearly eight out of 10 U.S. tax filers get a federal tax refund. The average amount paid over the past few years was roughly $2,800, according to the most recent IRS data. Who gets these refunds varies by income group. While 84% of those making less than $50,000 received a refund in 2012, only 34% of those making more than $200,000 did, according to an H&R Block analysis of IRS data. But their average refund - at $12,611 - is more than six times the average $2,086 that those in the lowest income bracket received. Of course, any financial planner will tell you that a refund is nothing more than an interest-free loan to the government, and that tax filers would be better off if they'd had the money during the year to invest or pay off debt. But fear tends to be a bigger motivator. "Many people want to make sure they don't owe the IRS money," said Katherine Pickering, executive director of H&R Block's Tax Institute. So they err on the side of having too much withheld from their paychecks. 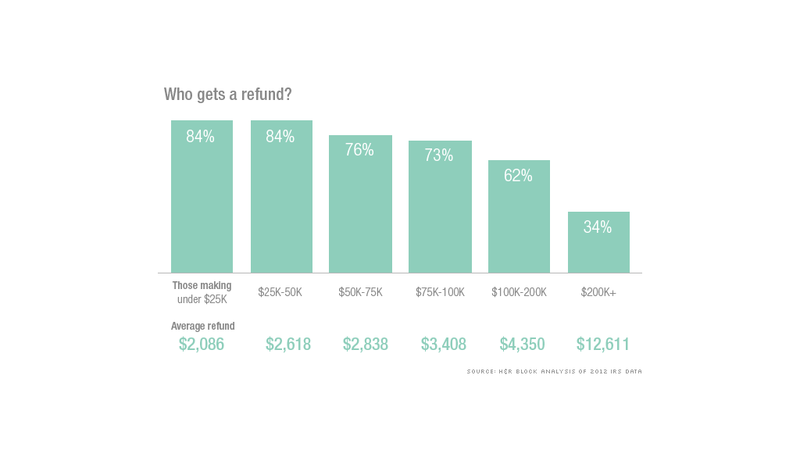 The other big reason so many people receive refunds: tax breaks. For low-income filers, a big part of their refund is due to the Earned Income Tax Credit, which they can claim as long as they hold a job. The EITC is an antipoverty program designed to encourage and reward work, and it primarily benefits workers who have children. For those higher up the income scale, the actions they take during the year can make them eligible for more tax breaks and set them up for a refund - whether they buy a house, move to a high-tax state or city, bump up their charitable contributions or make their home more energy efficient. So, what do taxpayers do with all of that refund money? Last year, the two most common things people did were pay bills and make big-ticket purchases - such as buying a car or paying for a vacation, Pickering said. A small percentage used their refunds to help pay down a mortgage or other home loan. Conspicuously absent from most refund recipients' list, however: Using the money to bolster their savings, she said. Normally, the IRS cuts its refunds checks pretty quickly. But this year, because of budget cuts, IRS Commissioner John Koskinen has warned that there could be a delay in issuing them.